"A Superior Quality Professional Electric Nail Filing System”! The KP-1500 hand piece with it’s dynamically tuned engine delivers high torque, and speeds up to 25,000 rpm with virtually no vibration! Also featured is the quick release chuck system that, allows the operator to change bits with a simple twist of the wrist! 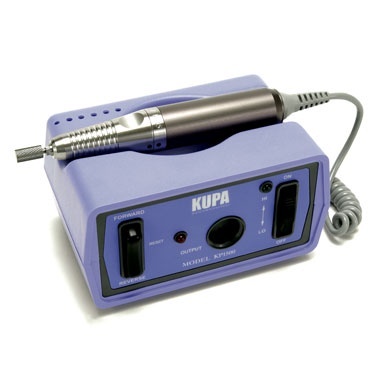 The unique control box with built-in handpiece cradle and bit stand occupies less than 8cm x 13cm of table space. A selector switch for forward or reverse, and dial speed control.